Many churches are involved in supporting projects and missionaries, but is the Church really missionary minded? 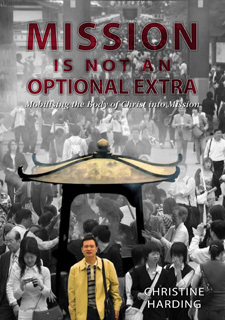 What is the relevance of mission to the daily life of every believer? The Great Commission, OMF NZ director Christine Harding argues, isn't a voluntary activity or an optional extra engaged in by a few enthusiastic people. God's plan for mission originated from the very beginning of creation. Every person has the ability to bring something unique and significant to the Church's team effort in this vital calling. The challenge is to mobilise the entire Church in labouring for the Kingdom, not only within the community of believers, but throughout the week as they go about the work and tasks of their daily lives. This book is a 'Mission 101' - a tool to aid pastors, leaders, and all Christians to understand the biblical basis for total involvement in God's mission, with suggestions for how to bring about change in our world. Christine, with her husband Andy, was involved for 10 years in church planting in Japan with OMF. Over the last 10 years she has been involved in local church leadership and teaching in New Zealand as an ordained pastor in the ACTS Churches NZ. She recently completed an Master of Theology with Laidlaw-Carey. Christine is the National Director of OMF in New Zealand.